So you need some materials for teaching the mechanics of writing to ESL learners. Where do you look? And what are you looking for exactly? When you take your car to a mechanic, you are looking for an expert in all the working, moving, large and small pieces that must work precisely in order to make your car run. The mechanics of writing are all the bits and pieces that must be used correctly to make your sentences and paragraphs communicate properly. The mechanics of English include rules and regulations regarding things like punctuation, capitalization, spelling, parts of speech, and abbreviations. When you search the Internet for materials for teaching the mechanics of writing, you may find an overwhelming amount irrelevant information because it's such a broad topic. To refine your search, start by checking out the grammar information here on YourDictionary to look for the specific thing you need - comma rules, homographs, how to use quotation marks, parallel structure, etc. By searching for precisely what you need, you will be more likely to find it. YourDictionary ESL grammar experts have also prepared three printable teaching aids to help you teach the mechanics of grammar to the ESL student. The first printable teaching aid is shown at the top of this article and includes the basic rules of capitalization. If you can't find the perfect worksheet online that matches the problem areas of your students, you can create your own. Just have each student in your class write a handful of sentences (Pro Tip: Have them write sentences using their most recent vocabulary words.) and turn them in. As their teacher, you are probably all too familiar with their struggles already; but, if you don't have anything in mind that you'd like to teach, go through their sentences and choose one or two common problems. Maybe they are connecting two independent clauses with a comma rather than a period, semi-colon, or comma and conjunction. Maybe you can't tell the difference between their commas and their periods. Maybe they capitalize words that aren't proper nouns or adjectives. Maybe they don't capitalize words that are proper nouns and adjectives. There's always something. Choose a handful of sentences that include the mistakes on which you'd like to focus. Teach the correct way of doing things, and then use your students' work as editing practice. Karate is a Japanese word that means "empty hand." Karate editing usually involves a writing instrument of some kind, but it is wielded minimally. When your students do a writing assignment, don't correct it. Simply underline or circle places where a correction is needed, and let the students make their own corrections alone or with partners. Most of the time, they can do it on their own, and the more they see and correct the same mistakes, the less frequently they make them. For more of a challenge, simply indicate the number of mistakes in each line without saying where they are. Find a book - any book with English sentences in it. Choose 5-7 sentences, remove 1-2 words from each, and either write them on the board or dictate them to your students (with blanks where you removed words). Have your students work together to determine what parts of speech are possible in each blank. Some blanks will only have one possibility while others will have several. Then give your students a word bank with words to choose from to complete the sentences. If they don't know the meanings of any of the words, give them the parts of speech. That way, they can use their own work from the previous activity to determine where each word goes. Once the words are in place, the students will know the part of speech of each word, and they will have it in a context through which they might be able to determine (or guess at) their meanings. Purdue's Online Writing Lab has lots of great resources and information to help your students with things like sentence clarity, transitional devices, dangling modifiers, parallel structure, capital letters, and gerunds. Time 4 Writing has a few free resources students can use to work on parts of speech, subject-verb agreement, punctuation, and homophone/homonyms/homographs. Illinois State University has put together a list of common mistakes in English vocabulary, grammar and mechanics along with their corrections. 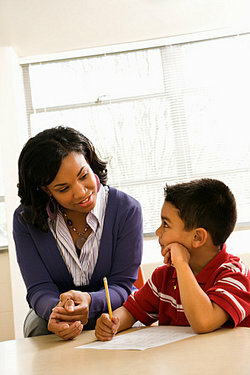 You can help your ESL learners master the mechanics of writing if you give them the info, tools and lots of practice. "Materials for Teaching the Mechanics of Writing to ESL Learners." YourDictionary, n.d. Web. 21 April 2019. <https://esl.yourdictionary.com/esl/esl-lessons-and-materials/materials-for-teaching-the-mechanics-of-writing-to-esl-learners.html>.